Evaluation: Massive big man with a developing game inside. Pierce is a young prospect for his class that is already good on the defensive end as a shotblocker and space eater. He shows nice signs of being an offensive finisher who can use his size and power to score around the rim. While his back to the basket game is still in development Pierce does show promise. Bottom Line: Colleges love Pierce because of his size, relatively good athleticism, and raw potential. While he still has a long way to go in becoming productive, Pierce looks like a definite Division I prospect. 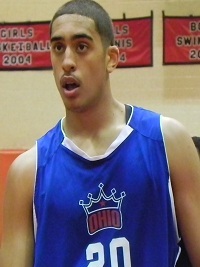 Notes: Transferred from Akron St. Vincent-St. Mary’s to Kiski Prep (PA) after his junior season, and reclassified, going from a 2013 prospect to a 2014 prospect.